Northland Fishing. Better than ever! Although the kitefishing scene seems to be a little quiet the boat fishing in Northland is anything but quiet. Tenga from Kaitaia Air and Tackle Supplies reports the fishing has been better than he has ever seen it. Houhora was the destination for Tenga's mate John and three others last Thursday afternoon. Fishing outside the harbour in a boat, the four fishermen managed to catch their bag limit of snapper each. It was blowing between 20 and 30 knots at the time but they managed to find a calm patch to anchor in and throw their lines over. The best three snapper of the day weighed in at 23lbs each. The smallest was 8lb and the rest were between 10 and 18lb. Snapper were the only fish caught on the trip and these fishermen are waiting for the weather to calm down again so they can get out in the boat for more fishing action. 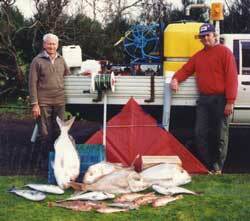 File photo : Peter and Laurie Grey with a winter catch taken from Kariotahi Beach. Greg from Fish City in Albany reports there are still a lot of small fish in close around Auckland. This is very unusual for this time of the year. The best fishing is out deeper, near the offshore reefs. Lots of burley is required to lure the big snapper out of their hiding places, but good snapper up to 15lb have been caught recently. Mark and I went out looking for trevally last weekend in the Manukau. We managed one trevally and two kahawai between us for the trip. This is very slim pickings compared to our normal catch rate, so it will be back to an early start this weekend. 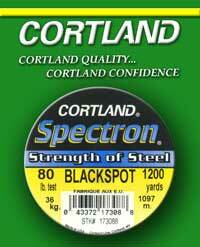 Once again the Target Hooks out fished the Kahle hooks Mark was using, so that was another positive for the day. Due to the inclement weather fishing around the Coromandel has been very slow. Kathy from Bay Bait and Tackle in Whitianga has not had any reports from fishermen in the last two weeks. It seems there are very few people getting out on the water due to the weather. The wind this coming weekend should be good for those looking for kitefishing opportunities on the east coast. Anyone on the Coromandel peninsula should not have far to go to put their kite out and catch a fish. Last weekend was very rough here at Porangahau Beach, 5 to 6 metre seas were running and the wind was fair howling. Harry Job was the only one who turned up on the weekend but the atrocious conditions got the better of him. On Tuesday one of the locals, Trev Sciascia took advantage of the lighter winds later in the day with his Paul's Super Kite powered Dropper Rig. He managed to get in just one set of 15 Target Snapper Hooks before dark. The results were incredible, every hook had a fish on. A very pleased Trev went home with 6 gurnard a few big kahawai and five spiny dogs. As I write this it is Wednesday, conditions are similar and Trev has just turned up with another local Andy Heke to have another go. I'll let you know what they catch next week. Andy has had a Paul's kite for a few years but never used it. It is only because of all the recent snapper successes around here that he thought it was time he tried it out. Don't forget if you are in the area call in to record your catch, have it photographed or have a chat and have a look over Paul's Fishing Kites range of products. If you have time you can watch Paul's Kitefishing Video. We now have in stock the heavy 31 kg Target Hook traces specially made up for this area and all our Shimano and tackle supplies are ON SALE NOW so it's worth while checking them out! This came on the 25/4/02 Due to the amount of news we have had recently we have saved this till now. For those who are unaware of what the weed is like, the following report will give you some idea. In the last two weeks we have fished Waipu Cove twice with our longline. What is with this horrible gunky seaweed that wraps itself around your line? It didn't used to be there! Yesterday it took four hours to beach our line, and while doing so the wind rose and the kite wound up in the tide. (Unsure of whether the dowel snapped or the kite dived, Robin didn't say). Result, gunk on the kite line too. Took it off the beach as it was, and this morning decided to ditch the kiteline ( from above the flag). Just too much of a pain to clear it and we had to return to Auckland anyway. Another sale coming up, Paul !! Consolation prize was one small snapper for our supper ! The weed normally appears in late summer and lasts for around six weeks. The locals call it red sack weed. The weed is still patchy even now and is spread between Whangarei South Head and Te Arai Point. The thickest concentrations seems to be from Uretiti Beach to Waipu. Usually the weed has disappeared by this time of the year and it is thinning out everywhere according to the latest reports. Good fishing is possible in the weed infested areas with a running float Dropper Rig as this system deploys the hooks midwater during setting and retrieval. The hooks are only set on the bottom when the rig is stopped. As the weed is close to the seabed this rig will overcome the weed. A full article with diagrams explaining how to set up and use the running float Dropper Rig will be in the July issue of the "NZ Fishing News"
The weed has been much thinner towards Te Arai Point and some excellent fish have been caught there over the past two to three weeks. Shane, whose report was in last weeks newsletter, caught another 10lb snapper at Te Arai Point last weekend. A customer came in to the shop this week to report that after reading last weeks newsletter about how Shane had caught some good fish at Te Arai Point, he too went kitefishing at Te Arai Point and landed a 14 lb snapper. While this particular customer was happy to receive the information from the newsletter he was reluctant to give any details to contribute to the next newsletter. This newsletter depends on your contributions to make it interesting and informative for all. We now have over 1,000 online subscribers and should be getting many more reports from around the country. It is up to you, the reader, to help us make this happen. Your reports make everyones fishing more successful and worthwhile.